In 2013, J. Craig Venter and Dan Gibson, in collaboration with Novartis, published a report in Science employing synthetic biology methods to rapidly accelerate the production of the flu vaccine. The methods described and implemented by the team demonstrated how to reduce flu vaccine production from months to just days. Yet, Venter and Gibson imagined there were ways to accelerate vaccine production even further, and so the idea of the digital-to-biological converter (DBC) was born. Fast forward to May 2017, the DBC concept is now a reality as Kent Boles and Krishna Kannan and Synthetic Genomics teams worked to make Venter and Gibson’s vision a tangible, working machine. The DBC prototype described in the Nature Biotechnology paper integrates several key Synthetic Genomic technologies into one comprehensive instrument that is capable of building DNA, RNA, proteins, viral particles, and pharmaceuticals from DNA sequence information. Central to the DBC prototype is the same DNA assembly process, including the Gibson Assembly® method and BioXp™ 3200 System, SGI-DNA’s automated instrument that builds DNA fragments and circular plasmids. The DBC adds the upstream capability of analyzing DNA sequence and designing requisite oligonucleotides with Archetype® software and synthesizing the determined oligonucleotides. The instrument then uses the deprotected oligonucleotides for DNA assembly and error-correction. In vitro transcription and translation are additional, integrated downstream processes added to the DBC capabilities. From entering the initial sequence into the DBC user interface, the remainder of the process operates completely hands-free without any human involvement. Someday soon, after prototype refinement, it is conceivable that DBC instruments could become integral part of hospitals and clinics. After evaluating a patient, a doctor could use the DBC computer interface to request an appropriate treatment, such as insulin or a vaccine, and the instrument could produce the requested medicine on-site. Especially in the case of a pandemic or for rapidly mutating viral infections, such as those caused by influenza A, such a rapid and personalized treatment approach could be much more effective and beneficial than current treatment plans. Refining and validating the DBC instrument prototype into a commercially available instrument will likely take two to three years, according to Dan Gibson. The full scientific report describing the technology and capabilities of the DBC is listed in the reference below. The DBC has also been featured in several media reports, including a San Diego Union Tribune article. 1. Boles KS, Kannan K, Gill J, Felderman M, Gouvis H, Hubby B, Kamrud KI, Venter JC, Gibson DG. 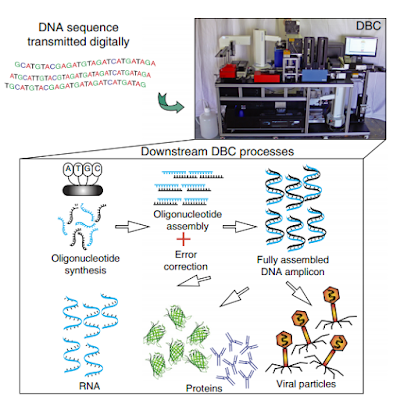 Digital-to-biological converter for on-demand production of biologics. Nature Biotechnology. 2017 May 29.
still want to know how this machine can confirm the machine quality it produced? Peptidomics? Interesting topic for a blog.free digital signage I have been searching the Internet for fun and came upon your website. Fabulous post. Thanks a ton for sharing your knowledge! It is great to see that some people still put in an effort into managing their websites. I'll be sure to check back again real soon.